Technology is Accelerating at an unexpectedly fast speed. New developing ideas are being created every now and then. The recent development in the Android world is what seems to be Catching the eyes of the public especially those TV game lovers. Google is making it possible for users to combine the mediocrity of Android gaming with the terrible experience of using touchscreen/accelerometer game controls. What this means is that, soon you will not have to use game controllers in order to play your favorite TV games on larger screens. What is going to happen is that you just need a couple of friends around with Android smartphones and viola! you are set to enjoy you TV games. 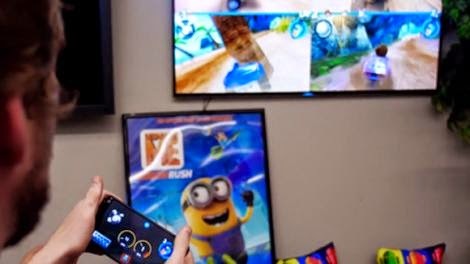 Google has added a “Nearby Connections” API to its Play Services developer tools so developers can let Android TV owners play games using their phones as controllers, according to the Android Developers Blog. The news comes not out of MWC 2015, like most of what we’ve been discussing this week, but from GDC, the San Francisco gaming conference that for some reason goes on at the exact same time. It may still be a while before developers start implementing phones-as-controllers support into Android TV games, but if that’s such a big problem for you that you’re actually tempted to go buy a bunch of Android TV controllers you should probably just shell out for a PS4 instead.